June 14, 2016, 7:01 p.m.
Plus: Adblockers, push alerts, and more in the new Digital News Report from the Reuters Institute for the Study of Journalism. By Laura Hazard Owen @laurahazardowen June 14, 2016, 7:01 p.m. But a new report out Tuesday from Oxford’s Reuters Institute for the Study of Journalism suggests that text may have a longer run, at least for news. Consumption of online news video is still a minority behavior around the world, the researchers found: Only about a quarter of respondents, across 26 countries, watched news video online in a given week. The Reuters Institute’s Digital News Report 2016 surveyed more than 50,000 people in those 26 countries, which include the U.S., Australia, Brazil, Japan, Canada, South Korea, and many European countries, about their digital news consumption. The research was conducted by YouGov with an online questionnaire in early 2016, and focuses on of-the-moment topics like adblockers and distributed content. Here are some of the most interesting findings from the report. For every group under the age of 45, in all the countries surveyed, online news is now more important than television news. Drilling down on types of online news a bit: 51 percent of those surveyed use social media as a source of news each week, while 12 percent of all surveyed say it’s their main source. And among 18- to 24-year-olds, social media alone edged out TV as the “main” news source (28 percent to 24 percent). Print came in at a lowly 6 percent for that group and at just 12 percent for those 55 and older. 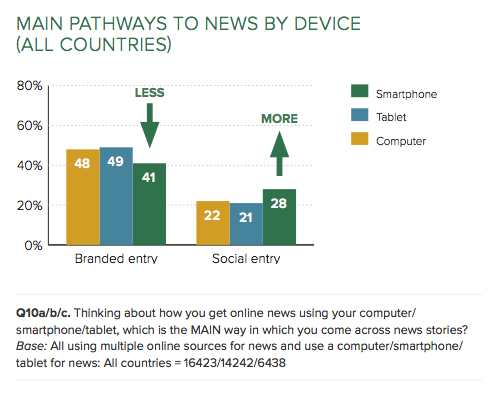 We also have evidence that the move to smartphone goes hand in hand with the move to distributed content. When we ask people about the MAIN way in which they come across news stories we see that people use social media more on the smartphone, whilst they are less likely to use a branded entry such as a website or app. The survey found that around 45 percent of respondents pay for a printed newspaper at least once a week. But paying for news online is a different story: A meager 9 percent of U.S. respondents, for instance, paid for any online news in the past year. 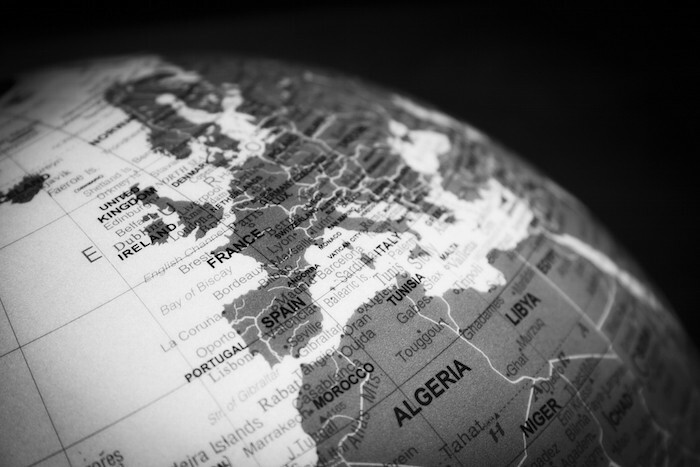 No English-speaking country has a payment rate of more than 10 percent — likely to be a consequence of intense global competition for digital eyeballs. By contrast some smaller countries protected by geography or language have been able to achieve rates of 20 percent or more, particularly where there is tradition of newspaper subscription via home delivery to build on. Video news isn’t as popular as you might think outside the U.S.
Across all 26 countries only a quarter (24 percent) of respondents say they access online news video in a given week…Video consumption is highest in the United States (33 percent), where there has been significant ramp up in production by many news organizations — attracted by higher advertising premiums and better distribution opportunities in social media. By contrast, our weighted European average shows that less than a quarter (22 percent) are using video news in a given week with some of the lowest levels in Denmark (15 percent) and the Netherlands (17 percent). That overall 24 percent number was up only one percentage point from a year ago (23 percent). The U.S. share was up from 30 percent a year ago. Across the report’s entire sample, 8 percent of respondents block ads on their smartphones, but a third of respondents in Germany, the U.K., and the U.S. said they plan to install an adblocker on their phone in the next year. Yahoo is still the most popular online news source in the U.S. This one surprised me, but it’s been true for awhile. 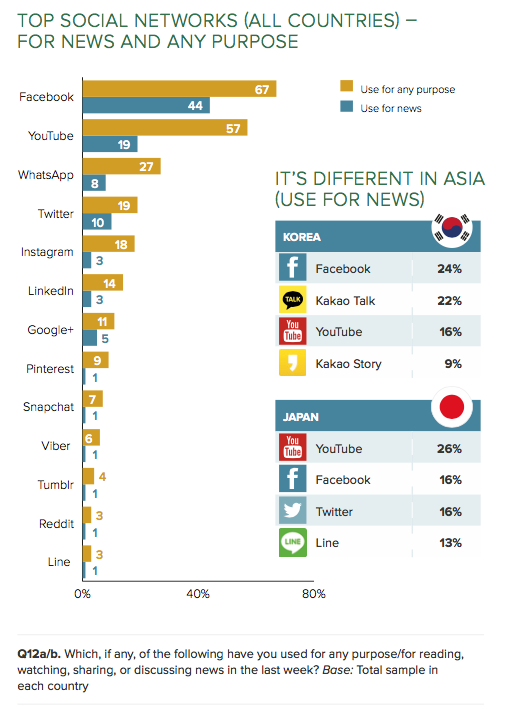 With the exception of WhatsApp and Kakao Talk in Korea, one surprise is the low levels of news usage for messaging applications. Although Snapchat is one of the fastest growing new networks, only around 1 percent in most countries say they use it for news. For the first time we asked specifically about usage of Snapchat Discover, a poster child for distributed content which was launched at the beginning of 2015 in the U.K. and U.S. as a showcase for branded news content from publishers like Cosmopolitan, Mail Online, and National Geographic. In our data we find that it reaches 12 percent of 18–24s of our U.S. sample but so far only 1 percent in the United Kingdom. Are we sick of push alerts? 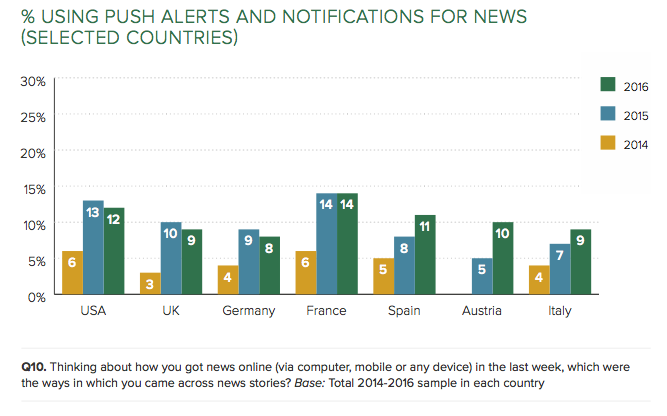 The percentage of people using push alerts and notifications for news has stabilized in the U.S., U.K., Germany, and France, the survey found. You can view the full report, which includes more detailed information on individual countries, here. POSTED June 14, 2016, 7:01 p.m.
Owen, Laura Hazard. 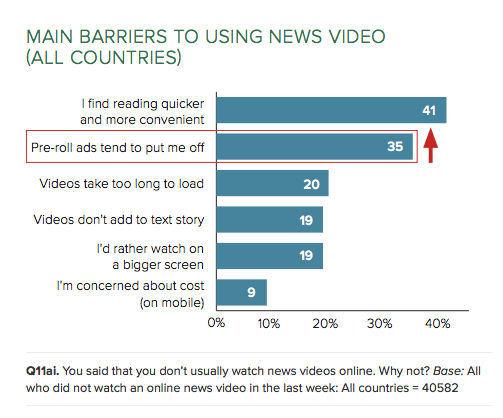 "Video news isn’t growing as fast as you’d think, and other surprising findings from a new global survey." Nieman Journalism Lab. Nieman Foundation for Journalism at Harvard, 14 Jun. 2016. Web. 19 Apr. 2019. Owen, Laura Hazard. "Video news isn’t growing as fast as you’d think, and other surprising findings from a new global survey." Nieman Journalism Lab. Last modified June 14, 2016. Accessed April 19, 2019. https://www.niemanlab.org/2016/06/video-news-isnt-growing-as-fast-as-youd-think-and-other-surprising-findings-from-a-new-global-survey/.